At Top Trenz, we carry the most comfortable fuzzy clothes for kids of all ages. 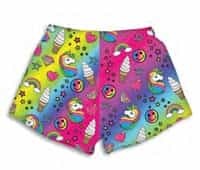 If your child is into unicorns, we have the cutest, softest unicorn pajamas and bathrobes in all sizes, as well as awesome unicorn and emoji blankets for curling up in bed or on the couch with their favorite movie or cartoon. We have fuzzy pajamas for sports fans and fleek print gear for the hippest kids in your family. All of our fuzzy clothes are brightly colored and made from durable materials designed to withstand frequent use and washing. Our fuzzy pajamas, robes and blankets allow your kids to express their personality in style and comfort. From unicorns to sports prints, we have something for everyone! Shop now to take advantage of our cozy, colorful selections with fast, free shipping on orders over $200, or contact our experts for help finding exactly what you need.